This document presents new findings about the American power structure based on the connections among 2,563 corporations, 6 business leadership and policy-discussion groups, 33 prominent think tanks, 82 major foundations, 47 private universities with large endowments, and 19 White House advisory committees for the years 2011-2012. In all, the database used for our study contains 2,750 separate organizations and 9,121 individuals. Along with the several new findings provided in this document, we've also made available an online portal for doing your own searches, starting with either individuals or organizations. In addition, for those who want to do systematic research using statistical tools, the raw data is available upon request. For those who might want to do their own network analyses, the most widely used program for such studies, UCINET 6 for Windows, can be purchased and downloaded at his link (there are student rates, as well as a free 90-day trial): https://sites.google.com/site/ucinetsoftware/. This database does not contain every last organization that constitutes the corporate community (defined as all those corporations and business groups that are part of one large interconnected network). However, it does encompass a large portion of the companies that are the largest and most important. Nor does it contain all the members of the leadership group that we call the "power elite," which we formally define as "those people who serve as directors or trustees in profit and nonprofit institutions controlled by the corporate community through stock ownership, financial support, involvement on the board of trustees, or some combination of these factors." 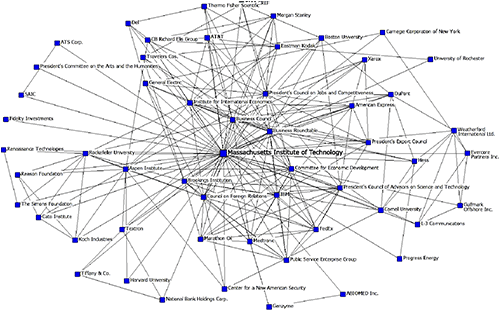 For purposes of this network analysis, we relax that definition slightly to include the people who are directors/trustees/members of at least one of the corporations or business discussion groups, or else are directors of think tanks or foundations that have at least one link to the corporate core of the database. It is important to note that in our definition, the organizations underpinning the power elite do not include the universities or government advisory committees that are in the database. They are included so researchers can study the extent to which university trustees and members of government advisory committees come from the power elite. More generally, it also would be possible to extend this database to study the degree to which members of the power elite are trustees of the numerous cultural, social services, and other nonprofit organizations that are active in the United States. There is already evidence in earlier studies that members of the power elite frequently serve on the boards of the largest and most prestigious of these organizations (e.g., Dolan 2011; Moore, Sobieraj, Whitt, Mayorova, and Beaulieu 2002; Salzman and Domhoff 1983). Although our definition of the power elite may sound overly precise, it is very useful for research purposes. It provides the specificity which skeptics often claim is lacking in studies of the power elite. For example, just because someone is rich, famous, or an elected or appointed official in the government doesn't mean that the person is necessarily part of the power elite. The definition also reflects the fact that the corporate world and the nonprofit organizations it directs and finances are very hierarchical. Lower-level corporate executives and the experts who work for corporate-financed think tanks are not part of the power elite, although some of them may eventually become members as they rise in the hierarchy. As an example of what we mean by a discovery, there's the fact that all of the Fortune 500 companies are part of the larger corporate network. It's also a discovery that some corporations have many connections within the network, and others have only one or two connections. In addition, it is a discovery that 33 of the 46 most visible think tanks and 71 of 159 large foundations have connections to one or more of the 2,563 corporations. Two caveats before we proceed: First, this is not the same database that was used for the findings that are presented in the 7th edition of Who Rules America?, published in 2013 with a 2014 copyright. After the analyses for that book were completed, the database underlying it was extended by Clifford Staples and then slightly altered for new purposes by Adam Schneider for use on this web site. In particular, this enlarged database includes the directors of companies not in the Fortune 500, the trustees of foundations and universities, and the members of governmental advisory committees. Thus, the findings in the book and in this document are not strictly comparable. They are very similar in many instances, and we included some analyses here that were also in the book, but overall the findings are not exactly the same. Second, those who make use of this database, either on this site or in their own software, must keep in mind that this is the power elite in one slice of time: 2011-2012. Since then, many people in the database may have dropped or added affiliations (or died), and new people may have been added as directors or trustees. A few of the organizations might no longer exist (in the case of failed corporations, or two companies that have merged). For any given year, however, this is basically what the American power elite looks like in terms of the organizations on which it is based and the kind of people that are part of it, as can be demonstrated by comparing the results using this database with many earlier studies using smaller or more specialized databases, as summarized in other documents on this website and in the various editions of Who Rules America? since 1998. Because this database is for general research purposes, it wouldn't add much, if anything, to constantly update it. Furthermore, that would be an unending, time-consuming, expensive process, and one that is best left to business magazines and Web sites that have more resources than we do. However, there is information from 2010 to 2012 that might be added that would make the current database more useful for future research, such as campaign finance information for 2010 and 2012. It's also likely that some readers may know some useful information of which we are unaware. The J3SG owners and interlockers also add international subsidiaries of major American corporations to the database, such as Mondelez ("world sweetness," a name suggested by a computer program). It was created primarily by Kraft Foods (#53 on the Fortune 500) to sell its candies, cookies, and other snacks all over the world. However, it's interesting that Mondelez also has directors from Coca Cola (#113) and Sara Lee (#180), two other companies that sell large amounts of sugar, caffeine, and fat to customers worldwide. 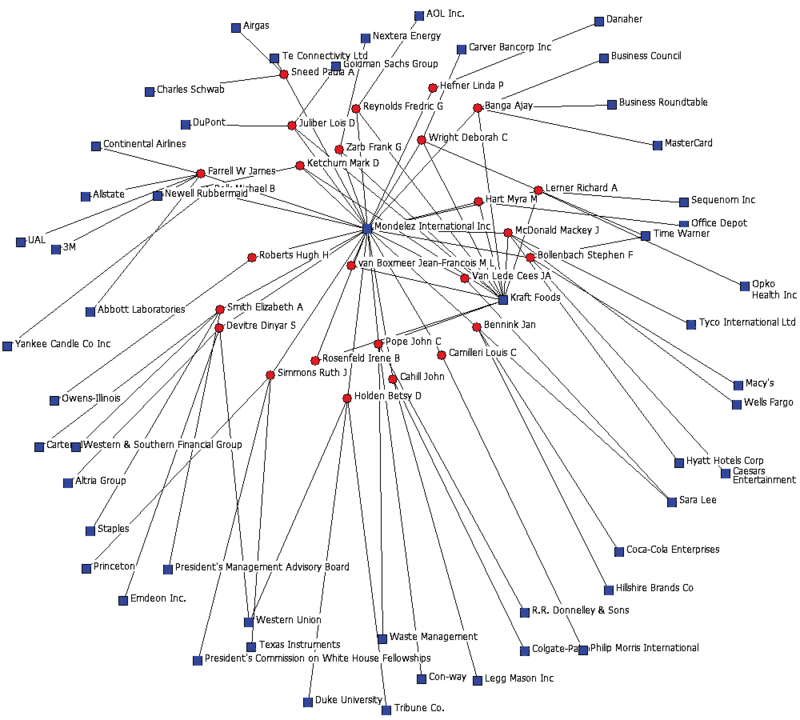 As shown in Figure 1, created by Staples using NetDraw, the directors of Mondelez link the company to many other major corporations, making it a very prominent "node" in the corporate network. The enlarged corporate network also includes companies that were formed to liquidate bankrupt companies, such as BB Liquidating, which sold the remaining assets of Blockbuster Video to Dish Network in April, 2011, for $233 million. There's also upcoming companies such as Take-Two (T2), a major producer of interactive entertainment software including Grand Theft Auto, whose four directors, all major investors, are collectively members of 48 other corporate boards. Studying the 222 members of the Forbes 400 in the corporate network, 71 of whom are directors of 65 different Fortune 500 companies, also leads to new findings. For example, the J3SG.com information reveals that Bill Gates, #1 on the Forbes 400 list, and Warren Buffett, #2 on the billionaire list, are far more than the major owners of Microsoft (#36 on the Fortune 500) and Berkshire Hathaway (#11 on the Fortune 500). Both of them are also "insiders" in smaller public companies as well, as shown by Table 2. It is also noteworthy that Gates serves on the board of Buffett's Berkshire Hathaway and that Buffett is a trustee of the Bill and Melinda Gates Foundation, which is by far the largest foundation in the United States. Note: The number in parentheses after a corporation indicates its Fortune 500 ranking. As a final step in building the corporate network, we added the leaders of six major corporate policy-discussion and leadership groups: the Business Roundtable, the Business Council, the Committee for Economic Development, the National Association of Manufacturers, the U.S. Chamber of Commerce, and the Conference Board. We found that the members of these six groups tended to come from major corporations; overall, 239 of the Fortune 500 companies in our database had at least one link to one of the six groups. Other members of these six groups were on the Forbes 400, or were owners or directors from large "privately held" corporations (which means their stock is not traded on any stock exchange) and financial companies (especially hedge funds). Table 3 presents the number of members in four of the six main business groups and the percentage of those members who were directors of at least one of the Fortune 500 companies in the corporate network. Note the dramatic difference between the conservative Business Roundtable and Business Council on the one hand and the ultraconservative National Association of Manufacturers and the U.S. Chamber of Commerce on the other, which may tell us something about their relative importance. * Most of the remaining 21% of Business Roundtable members are CEOs of privately held corporations or financial firms, or the presidents of American subsidiaries of large European corporations (Staples 2012). As can be seen, the Business Roundtable and National Association of Manufacturers have about the same number of members (209 vs. 224), and so too for the Business Council and the U.S. Chamber of Commerce (132 vs. 139). Nevertheless, the Business Roundtable and the Business Council have many more connections with large corporations than do the National Association of Manufacturers and the U.S. Chamber of Commerce. More specifically, the combined 271 members of the Business Roundtable and the Business Council, which includes the 70 members they share in common, had direct connections to 386 other organizations in the overall network. Although most of the connections are to corporations, including such well-known names as IBM, Citgroup, DuPont, General Electric, American Express and Verizon, there are also direct connections to 47 other organizations (the other four business leadership groups, nine think tanks, four foundations, 27 universities, and seven government advisory committees). 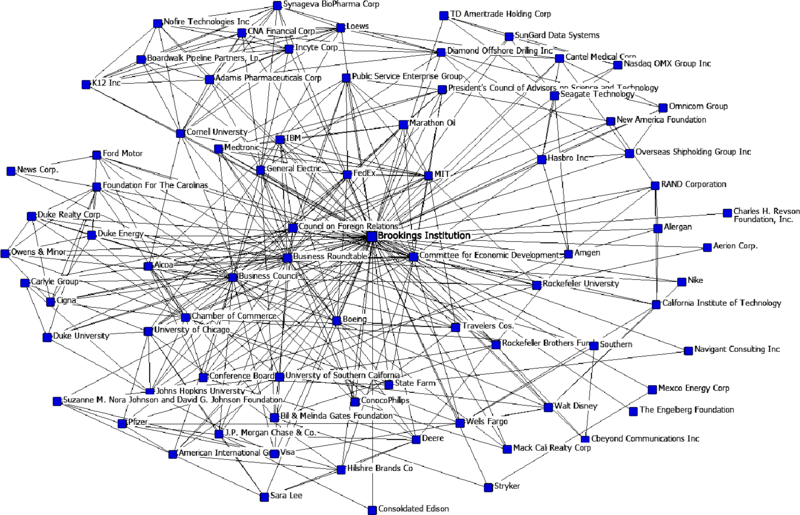 Then, too, the shared members among the six business leadership groups generate a revealing network, as seen in Figure 4. It shows, as might be expected from the results we just presented, that the Business Council and Business Roundtable are closely linked at the center of the six-group network. What makes the network even more interesting is the fact that the ultraconservative National Association of Manufacturers and U.S. Chamber of Commerce are on the right side of the network and the mildly conservative Committee for Economic Development is on the left side, which reflects the reality that they are "distant" from each other in a people sense as well as a policy sense. At the same time, the smaller and far less policy-oriented Conference Board, which primarily generates information of use to business and sponsors conferences, appears to be aloof from any policy differences and above the fray. There's another way to study the interconnections between the corporations and the six major business groups. That's by finding all the corporate executives from any one company who are in one of the six groups, not just the chief executive officer (CEO) and directors in our database. This analysis is of interest because many of the trustees of the U.S. Chamber of Commerce, the National Association of Manufacturers, and the Committee for Economic Development are vice presidents who do not sit on any corporate boards, and hence are not in our database. (The interlocks created by several executives from the same company are called "company interlocks.") We feel confident in making use of company interlocks in our work because it is inconceivable that mere vice presidents who work under the chief executive officer are not part of a closely-knit leadership team given the hierarchical nature of the corporate world. Vice presidents are the eyes, hears, and strong right arms for CEOs that can only be stretched so thin. 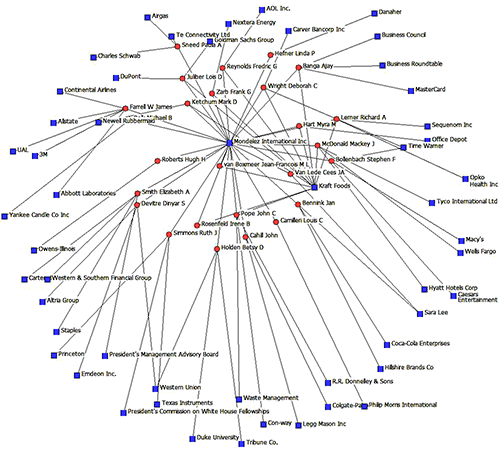 After totaling all the company interlocks, there were nine large corporations that had direct connections with four or more of the six groups, including Procter & Gamble with six such interlocks and Aetna and IBM with five. If company interlocks had been included in the network analysis, it might have shown that the six groups are closer than they seem when only CEOs (who are always on the board of directors) and other directors are included. Perhaps it then might be more accurate to say that the Business Roundtable and the Business Council are the organizations for the top dogs in the corporate world, and that the National Association of Manufacturers, the U.S. Chamber of Commerce, and the Committee for Economic Development are at a secondary level, since they are directed by vice-presidents of the biggest companies and the CEO's of smaller companies. It is at this point that interviews and a careful reading of newspapers and documents in organizational archives would become imperative in order to have a richer picture of the relationships among the organizations in this network. This example therefore warns us about one of the limitations of relying exclusively on network analyses alone to understand the business world. When all these different findings are combined, we think the large corporate network can be called a "corporate community" for a number of reasons, starting with the demonstrable linkages among thousands of organizations and people through shared directorships and large ownership shares in several companies. There is other evidence for this conclusion as well. These companies tend to use the same several thousand lawyers, accountants, public relations advisors, and lobbyists, many of whom are part of corporate law firms, major accounting firms, and worldwide public relations/advertising/lobbying conglomerates. The corporate leaders of these firms also share common interests and develop a similar worldview because they go through the same daily routines due to the fact that they are members of large-scale profit-making companies. Equally important, they have the same critics and adversaries, including union leaders, liberals, environmentalists, and (in their minds) the government officials they revile as "bureaucrats." They also hang out together in the same clubs, send their children to the same expensive private schools, and throw lavish debutante balls for their daughters (Kendall 2002; Kendall 2008; Ostrander 1984). The net result is the creation of an in-group "we" feeling and an "us against them" mentality, as Who Rules America: The Triumph of the Corporate Rich and several documents on this web site also demonstrate. The main limitation on the comprehensiveness of this extended corporate network is that it does not include the 212 largest privately held companies for 2010. Taken together, these private companies employed over 4 million people and accounted for a little over one trillion in revenues according to Forbes, which compiled the list. A list of these companies can be found at Forbes.com. We hypothesize that there may be numerous links between our database and at least the very largest of the 212 biggest privates, based in part on the fact that 23 of the CEO's of the large private companies are on the Forbes 400 list. However, it would take some sleuthing to find all of the owners and directors of these companies, some of which are very secretive. (Researchers with access to Mergent Online might be able to find much of this information.) For now, we know from a quick study of the 20 largest privately held companies that several of them are linked to this database through their owners and top executives' involvement with publicly held corporations (as directors), or as members of the six major business organizations (as trustees), or as trustees of a range of nonprofit organizations (Domhoff 2014, Chapter 2). But much more research needs to be done on them before we can be sure of the extent to which they are part of the larger corporate community. More research also needs to be done on the members of the Forbes 400 who are not in our database. We know from a cursory look that many of them are heirs of great American fortunes of the past (e.g., the Rockefellers of Standard Oil) and the present (e.g., the Waltons of Walmart), but there are many who need to be studied more closely, and maybe especially those who come from the middle and lower levels of society. A team of researchers at United for a Fair Economy has made a good start in this direction, but their report focuses on social origins, not current corporate connections (Moriarty, Ali, Miller, Morneault, Sullivan, and Young 2012). Does the network have a "center?" 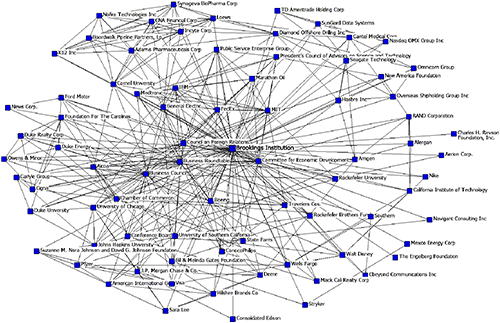 Are some corporations more "central" than others in the corporate network? That's a more difficult question to answer than it might seem because there are many different ways to measure centrality, and not all of them lead to the same conclusions. We discuss the problems of determining centrality in a separate document, "Centrality in Networks"; that discussion, along with some empirical analyses we did, leads to the conclusion that we should use the centrality measure that is most highly correlated with several other measures that yield about the same results. It turns out this measure is also the most simple because it relies on counting up each company's total number of interlocks. But there's still a potential problem with simply adding up interlocks: the more directors, the more likely there will be links. There are statistical ways that correct for this problem, as discussed in our linked centrality document. For purposes of this document, however, we decided to stick with a measure based on the total number of links because at least one of the measures that corrects (to at least some extent) for size provides very similar results as to the centrality of the largest organizations. 30 J.P. Morgan Chase & Co.
35 Bank of New York Mellon Corp.
We next added the six business policy-discussion groups to the Fortune 500 list that was used for the centrality analysis presented in Table 4. This analysis led to the discovery that the Business Roundtable and the Business Council then become the most central organizations; in fact, five of the six policy groups occupy positions #1 through #5 in the centrality rankings. Looking at the corporations, 28 of the 30 most central firms in the first analysis are still among the most central organizations in the enlarged network. Thus, we conclude that the six major business groups and several of the largest companies are at the heart of the corporate community — as shown in Table 5, which presents the 50 most central organizations in the corporate community based on an analysis of the Fortune 500 and the six business policy groups. 37 J.P. Morgan Chase & Co. It is very likely that the largest companies at the center of the network are powerful because of their major roles in the economy and the number of different resources they can deploy through such avenues as grants, lobbying, and campaign finance. In the case of the business groups, they are not powerful in and of themselves, nor are they information hubs. Instead, they are places in which powerful people that already have a great amount of information in hand meet to decide on what policy directions to take. What we have presented here should be seen only as a rough overview of the corporate community and a starting point for further research. It needs to be supplemented by other types of research, such as that presented in other documents on this website and in the various editions of Who Rules America?. With the corporate network now established, we turn a series of brief analyses to determine which if any of the think tanks and foundations we studied have at least one link to the corporate network. The names of the directors in the corporate network were matched with the trustees of 46 "prominent" think tanks, as determined by an academic expert at the University of Pennsylvania who spends full time tracking think tanks. We found that 33 of the think tanks had at least one connection to the corporate network. The think tanks that were eliminated for lack of any corporate links turned out to be fairly liberal, highly conservative, or very small, specialized groups that focused on foreign policy. When the six major business groups were reinserted into the database, three of them (the Business Roundtable, the Business Council, and the Committee for Economic Development) were the most central organizations in the combined corporate/think tank network. The other three general business groups, the nine think tanks, and ten of the large corporations that were high in centrality in the previous analysis joined them in the top 25. In order to approach centrality from another angle, we did an analysis in which the members of the Business Council and Business Roundtable were used as the starting point. The resulting egonet shows the extent to which the combined corporate community and policy-planning networks can be reproduced with just the 271 people who were in one or both of those groups. It revealed that 40% of the organizations were connected directly or indirectly to the Business Council and the Business Roundtable. Based on these separate analyses of the combined database, we conclude that the corporate community and the policy-planning networks are integrated into one larger network. The 40 highest-ranking organizations in the database of Fortune 500 firms, business groups, and think tanks are listed in Table 6. The extent of the interlocks between the corporate community and the world of think tanks is a major finding that has theoretical implications. It casts doubt on any claim that think tanks are a unique independent sector. The idea that think tanks have a considerable degree of independence becomes even more questionable when it is added that they receive a significant share of their funding from wealthy individual donors and the various types of foundations that are discussed in the next section. Although those researchers who focus on "institutions" and "institutional fields" will cringe and cry foul, we believe the think tanks in this database are best characterized as subsidiaries of the corporate community. If the analyses in this document were to be extended to other types of national-level nonprofits, such as cultural organizations or organizations that provide social services, it is likely that many of them would be part of the power elite network. As noted at the outset, there is evidence for this claim in earlier work on databases that include prominent nonprofits and the top 100 corporations (e.g., Dolan 2011; Moore et al. 2002). These studies show that no sector of the nonprofit world has very many interlocks within it. Nor are there very many interlocks among nonprofits in general. Instead, their most frequent links are with large corporations, whose directors also create many of the interlocks that nonprofits have with each other. Based on these findings, it would be interesting to see if our expanded corporate network would encompass even more nonprofits. In addition, case studies of a small number of nonprofits with a variety of different missions show that they are linked to the corporate network through company interlocks. Corporate vice presidents for public relations, communications, diversity, or government affairs frequently create these links. Adding to their clout on the nonprofit boards, these lower-level executives are often in charge of the corporation's foundation, which among other things provides money to nonprofits (Domhoff 2014, Chapter 5). Thus, the widely accepted idea that there is a "third sector" between the business world and government, which is often promoted by leaders of nonprofit organizations, is called into question by these findings. It is now time to expand the power elite network one step further by determining which foundations and their trustees, if any, have at least one link to at least one corporation in the database. Three basic types of foundations provide money for education, the arts, think tanks, social services, and other nonprofit sectors in the United States. Family foundations, such as the Gates, Ford, Rockefeller, Carnegie, and Sloan foundations, are based in large corporate fortunes. Corporate foundations, of which there were 884 according to the 2012 edition of the Guide to U.S. Foundations, are controlled by the top officers of the corporations that created them. Community foundations receive most of their money from family foundations, corporate foundations, and personal gifts by wealthy families. Since the corporate foundations are part of corporations, this section will focus on family and community foundations. The importance of foundations (including corporate foundations) to the think tanks is revealed by summary figures based on an analysis by Staples of information on the Foundation Directory Online. Between 2003 and 2011, 1,260 foundations gave $1.9 billion dollars via 10,549 individual grants to the 41 most prominent think tanks, a slightly larger number of think tanks than qualified to be in this database. But the number of extremely important foundations is much fewer than that figure suggests: the 25 largest foundations alone accounted for over 71% of the total donations. Table 7 presents the funding totals provided to think tanks by the top 15 foundations for 2003-2011. Starting with 159 large foundations to cast as wide a net as possible, there were 57 family and 14 community foundations with at least one link to a corporation or one of the six general business groups, for a total of 71 foundations in all. These foundations include most of the largest family foundations throughout the United States and the community foundations in cities such as Atlanta, Boston, Chicago, Cleveland, Houston, Kansas City, New York, and Tulsa. However, there are many family foundations that have only one tie to the overall network, usually through the wealthy corporate owner who founded the foundation. Table 8 provides the corporate and think-tank connections for the 10 largest family foundations in 2011-2012 (in terms of assets) that make grants to more than one or two organizations, as well as for the historically important Rockefeller, Carnegie, and Alfred P. Sloan foundations (the last from a General Motors fortune), which are still among the top donors to think tanks. The table reveals that most major foundations have far fewer links to the corporate network than do the think tanks. This is a distinct change from earlier decades (Domhoff 1967; Domhoff 1983). One reason for this change as far as the Ford and Rockefeller foundations is that they now have a few trustees from other countries, including business leaders from those countries. The decline in corporate representation on foundation boards also coincides with the rise of corporate foundations since the 1980s, which now make very large donations from corporate treasuries to a wide range of nonprofits in addition to think tanks (Domhoff, 2014, Chapters 4 and 5). As many of the smaller family foundations passed into the hands of the second and third generations of the founding family, corporate leaders decided to provide tax-free charitable funds directly from their corporations. There were 47 private colleges and universities with endowments of $1 billion or more in 2011-2012. When the names of their trustees were matched with the names in the power elite database, we found that all but one of them (Amherst College) had one or more connections to it, although several of the small private colleges were only linked through one corporation, think tank, or foundation. When the trustees of the 10 most-connected universities were examined in more detail for an earlier study, they had 300 connections to corporations, 31 connections to think tanks, and 15 connections to policy-discussion groups. 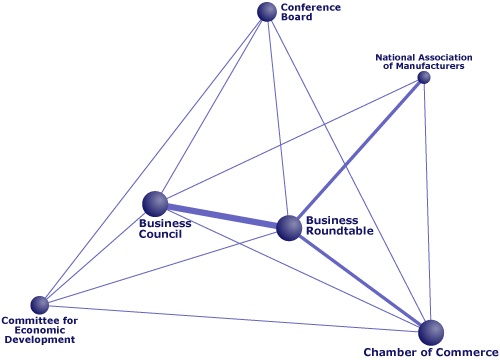 The Business Council had seven connections, the Business Roundtable six, The Brookings Institution five, and the Council on Foreign Relations four (Gleditsch 2013). Table 9: Links between the 10 most-connected universities and the corporations, think tanks, and business policy-discussion groups in the database. The egonet for the most-connected university, M.I.T., is presented in Figure 4. Figure 4: The network radiating out from M.I.T. The $64 million question in power structure research is if and how the power elite have the ability to influence government, whether directly or indirectly, to the point they could be said to "dominate" government on the issues of concern to them, which also are bread-and-butter and life-and-death issues for most Americans. There are several direct linkages that have been studied in detail in the effort to answer this question: lobbying, testimony before Congressional committees (based on think-tank and policy-discussion group reports), and paid full-time appointments to key departments of the executive branch (most secretaries of state, defense, and treasury in the twentieth and early twenty-first centuries came from the power elite) (Domhoff 2014, Chapter 7). In this section we focus on a less known and less studied direct link that involves many dozens of corporate executives, think-tank trustees, and foundation trustees, namely, the federal advisory committees that are appointed to advise the White House and/or specific departments and agencies of the government. In particular, we look at the federal advisory committees and councils that are appointed by President Barack Obama. In one relatively recent study, it was reported that the federal government had about 1,000 advisory committees with approximately 37,000 appointees. Most of these appointees were professionals in medicine, education, and social welfare who were providing assistance to the Department of Health and Human Services and the Department of Education. Another 10% were on committees related to the Department of Transportation. Others gave advice to science agencies of the government. There were few or no people from the corporate community who served on these committees (Moore et al. 2002). However, as several studies show, there are numerous business representatives on a wide range of committees (Karty 2002; Priest, Sylves, and Scudder 1984). For a full discussion of past studies of federal advisory committees, see "Federal Advisory Committees" on this site. One particularly revealing study, based on secret documents from the Industrial Advisory Committee to the Department of Defense, which advised the Secretary of Defense on weapons procurement from 1962 to 1972, also can be found on WhoRulesAmerica.net: "Top Dogs and Top Brass". The most comprehensive study of interlocks between federal advisory committees and for-profit and nonprofit organizations was carried out by sociologist Scott Dolan (2011, Chapter 6) with a 2006 database that included the 100 largest corporations as well as numerous foundations, think tanks, policy-discussion groups, and federal advisory committees. Dolan discovered that many of the top 100 corporations and several of the think tanks and foundations had one or more members on advisory groups. The corporations were most likely to have representatives on advisory committees in the departments of defense, commerce, energy, and state, along with Homeland Security, the Federal Communications Commission, and the Office of Science and Technology. Similarly, think tanks and policy-discussion groups had their most frequent connections to the defense, commerce, energy, and state departments. On the other hand, corporations, think tanks, and foundations were not involved in advisory committees concerning health and human services, education, or the arts, whose members were overwhelmingly from the medical, scientific, university, and arts communities. Dolan's findings are consistent with an earlier study of advisory committee linkages to the profit and nonprofit sectors for the mid-1990s: 72% of the 100 largest corporations and 83% of 12 thinks tanks and general business discussion groups included in that study had members on federal advisory committees (Moore et al. 2002). For example, the Defense Policy Advisory Committee on Trade within the Department of Defense came primarily from the defense industry, while the National Security Telecommunications Advisory Committee in the Department of State came from telecommunication, information, and electronic companies. CEOs made up the entire membership of some of these advisory committees. Dolan's findings also fit with the close connection between the Business Roundtable and key federal advisory groups in the Department of Commerce during the battles over the passage of NAFTA in 1994 and permanent normal trade relations with China in 2000. In both cases the advisory committees were especially important because consultation with advisory committees in the Department of Commerce that are concerned with trade issues is mandatory due to legislation passed in 1974 (Dreiling and Darves 2011). * Theresa Heinz, an heiress to the Heinz Ketchup fortune and a trustee of her foundation (The Heinz Endowment), is the sole member of the power elite on this committee. To provide a quick glance at the work of one of the most important of these White House advisory groups, based on work carried out by Staples for an earlier project, we now turn to the presidential advisory group that had the most ties to the corporate community. Given the extent to which unemployment became a major issue due to the 2008 financial crisis, it is not surprising that President Barack Obama established a President's Council on Jobs and Competitiveness in early 2011 to seek solutions and give him policy advice. But the charge for the council was larger than jobs: it included growth, competitiveness, innovation and job creation. As of late 2012, the council claimed several accomplishments, most of which actually had more to do with corporate competitiveness than with jobs. (In fact, replacing employees with machines, cutting the size of the workforce, or shipping jobs overseas can improve "competitiveness.") The council recommended streamlining the application process for entrepreneur visas to stimulate investment by attracting foreign entrepreneurial talent, a recommendation that was carried out by the Department of Homeland Security. It also recommended that the Food and Drug Administration reform the approval process that protects patients in order to speed up the development of new therapies and medical technologies, which led the agency to recruit established entrepreneurs in the medical industry to help newcomers learn the necessary steps. Further, the council called for a program to increase the number of engineering students and the availability of internships for them. It called for faster government payments to small suppliers, which led to a Presidential Memorandum accelerating payments to small business contractors. To create jobs in the construction industry, the council recommended retrofitting government and commercial buildings for energy efficiency, which gave President Obama the support he needed to call for $4 billion for such an effort. For the council's other recommendations, see http://www.jobs-council.com/recommendations/. This document has presented several findings that support past studies using smaller databases. It shows that a large number of corporations are linked together by shared directors and common ownership, and that many prominent think tanks and foundations are linked to this corporate network. The results suggest there is reality to the concept of a "corporate community" and that the extended network provides the leadership for the corporate rich through the group we call the power elite. Furthermore, the document shows that members of the power elite are frequently trustees of major universities and members of government advisory groups. But the document only scratches the surface of how the power elite database could be useful to future researchers. It is a starting point for doing further network analyses, for extending the network by adding new organizations, and for doing case studies of central organizations and cliques within it. Dolan, Scott V. 2011. "Business as usual: The nonprofit sector in the U.S. national elite network." Ph.D. Thesis, Sociology, University of Albany, Albany. Domhoff, G. William. 1967. Who Rules America? Englewood Cliffs, NJ: Prentice-Hall. Domhoff, G. William. 1983. Who Rules America Now? New York: Simon and Schuster. Domhoff, G. William. 2014. Who Rules America? The Triumph of the Corporate Rich. New York: McGraw-Hill. Dreiling, Michael and Derek Darves. 2011. "Coporate unity in American trade policy: A network analysis of corporate-dyad political action." American Journal of Sociology 116:1514-1563. Gleditsch, Rebecca. 2013. "Universities in the power elite." Department of Sociology, University of North Dakota, Grand Forks, ND. Karty, Kevin D. 2002. "Closure and capture in federal advisory committees." Business and Politics 4:213-238. Kendall, Diana. 2002. The Power of Good Deeds: Privileged Women and the Social Reproduction of Class. Lanham, MD: Rowman & Littlefield. Kendall, Diana. 2008. Members Only: Elite Clubs and the Process of Exclusion. Lanham, MD: Rowman & Littlefield. Moore, Gwen, Sarah Sobieraj, J. Allen Whitt, Olga Mayorova, & Daniel Beaulieu. 2002. "Elite interlocks in three U.S. sectors: Nonprofit, corporate, and government." Social Science Quarterly 83:726-744. Moriarty, Shannon, Mazher Ali, Brian Miller, Jessica Morneault, Tim Sullivan, and Michael Young. 2012. Born on third base: What the Forbes 400 really says about economic equality and opportunity in America. Boston: United for a Fair Economy. Ostrander, Susan A. 1984. Women of the Upper Class. Philadelphia: Temple University Press. Priest, T. B., Richard T. Sylves, and David F. Scudder. 1984. "Corporate advice: Large corporations and federal advisory committees." Social Science Quarterly 65:100-111. Salzman, Harold and G. William Domhoff. 1983. "Nonprofit organizations and the corporate community." Social Science History 7:205-216. Staples, Clifford. 2012. "The Business Roundtable." In G. Murray and J. Scott (Eds. ), Financial elites And transnational business: Who rules the world? (pp. 100-123). Northhampton, MA: Edward Elgar Publishing.